The 2700MTK Pro allows you to use just one engine and a range of tools to suit your jobs. Benefits you as you only need to fill one item with fuel and oil. Kawasaki engines have an excellent design and high performance and guarantee low noise and vibration. 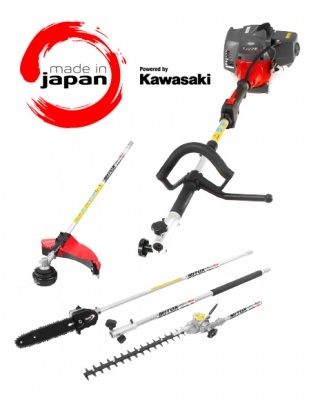 The package comes with a brush cutter for cutting the grass, hedge trimmer for trimming your hedges, pruner for pruning the trees and for ease of access a 1 metre extension pole. For commercial users this package comes with a 3 year warranty and for domestic users it comes with a 5 year warranty.